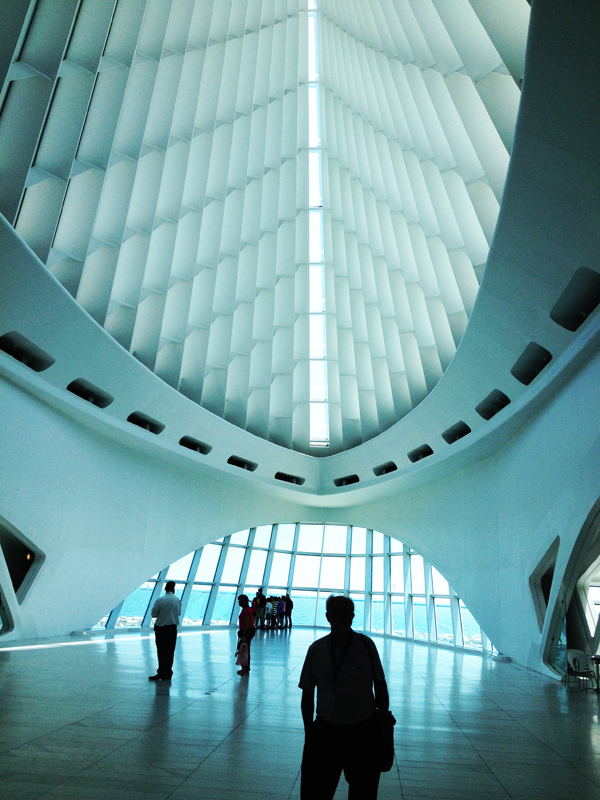 Inside the Milwaukee Art Museum. This post has few pictures because museums don’t like you to take pictures of the collections. The links I provided will show you official pictures. I have visited (more accurately “re-visited”) two museums here in Milwaukee and that got me to musing about a citizen’s responsibility to support culture, something I actually preach fairly often. Now I have a reason to do it, but first I will describe my museum trips. The first was a trip to the Milwaukee Art Museum, that gorgeous oh-so-photogenic creation by Santiago Calatrava that graces the shore of Lake Michigan in an otherwise rather understated gem of a Midwestern city. We went to see an exhibition on Kandinsky. Our timing was off! Despite all the advertising we had seen for the show, it doesn’t start until some amorphous time called “next week” when we won’t be here. We decided to wander around anyway. The best thing about visiting a museum repeatedly is that you can skip stuff you’ve looked at before and really see stuff you skipped over. This time I wandered into the Biedermeier furniture section and had to slow down and take a look and actually read some of the labels. Low and behold! I learned something new and added “Research Biedermeier” to my list of things to do. The other best thing about re-visiting a museum is seeing “old favorites”. Like old friends, they are easy to look at and fun to enjoy time with, just because. The second trip was to the Milwaukee Public Museum. The Body Worlds exhibit is here – I swear I saw it here about 6 years ago – so maybe it is still here. Gerry Sr. had never seen it, so we decided to visit. My memories of it centered on the lungs of smokers versus non-smokers, sparking the “dodged the bullet” emotion that we all so like to experience! We also spent some time wandering around the museum, checking out other exhibits and basically dodging around school children who were busy dodging around us and eluding their teachers. So, as I mentioned, learning new things can keep our brains healthy and functioning…Do you need another reason to go out right now (or tomorrow if you’re reading this at night) to visit a museum where you live? Sure, you’ve been there before. (Like a hundred years ago when you chaperoned a school field trip?) My guess is that it has probably changed – or there is a new exhibit – or you will find something to enjoy there that is new to you… and maybe learn something new or think about something you haven’t thought about before. Even, if you’re like me, you might analyze whether the museum is well-organized, showing relevant topics, engaging the hundreds of kids who may be there, or watching how the adults that accompany them react, etc. In short, you will be using your grey matter, making a deposit in the “brain bank” against future dementia or worse. And that gets me to the topic of supporting culture. I believe that every person who can afford to should become a member of every cultural entity in his or her community. These entities are important to our society. Whether it is art, music, educational, libraries, etc., these organizations depend upon public support (specifically money) to survive. Becoming a member is one way you sustain them and make it known that you support them beyond a single visit. By sustaining them, you allow those who cannot afford even the price of a single day’s ticket to take advantage on the day when entrance is free. I will go so far as to say, I don’t care if you NEVER visit your local art museum. You should still become a member and support it financially. Think of how it contributes to your community (tourism and education come to the forefront of my mind). Give a donation, too, but become a member. Being a member is making a statement. The same goes for music organizations like opera, the symphony; or dance companies, theater companies – your support means a lot. You don’t like opera? Give the tickets away! You don’t like classical music – again give your tickets away. Support the idea that these are great things for a community to have. They are something that all residents and visitors can enjoy, no matter age, race, gender, sexual orientation, what have you. They are for everyone. They make our communities better places – perhaps we could say they even make us better human beings. At least we are more knowledgeable! And you know, a lot of people come to love opera – just by being exposed to it over time – ditto with classical music. That could be you, and your support now will dictate whether it is still there for you to enjoy when you’re ready! When I was in Milwaukee a few summers ago we were walking toward the lake and came upon this space ship looking building and it was a sight to behold. I loved the outside but my group did not want to go inside unfortunately. I must go back- but it is a work of art itself!